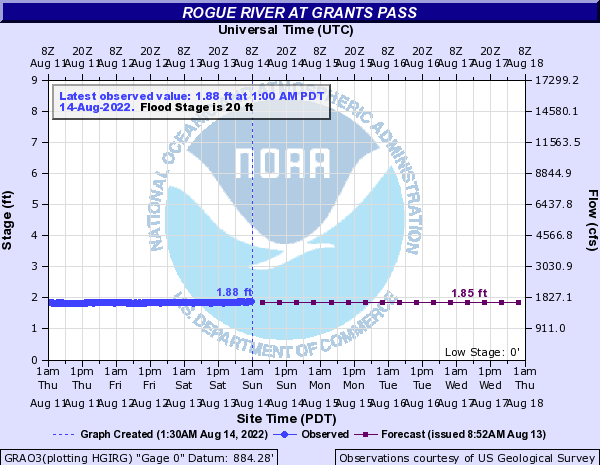 Just below the city of Grants Pass, OR, the Rogue begins it's Wild and Scenic corridor section. This is another great multi-day setion of the Rogue with many put in and take out options. This is also a great stretch for fishing. Around mile 19 the Rogue enters Hellgate Canyon. The river passes through basalt rock that rises over 150 to 200 feet. See access description here, for more info. This is another nice launch facility that includes RV hookups, toilets and a concrete ramp. Access is on river left or the south side of the river. By car you can reach this park via Highway 199. Access is on river right. By car you can access it form the lower river road on the north side of the Rogue. There's a concrete ramp and minimal parking. This is a decent access point for day trips. The whitehorse park has parking and a concrete ramp located on the north side of the river. There is tent and RV camping available here as well. This is a primitive access point on the Rogue where the river makes a very sharp right at what's known as Finley Bend. There is a large gravel bar you can drive on to access the river but there is no formal ramp. This access is better used by fisherman or smaller craft like canoe or kayak. Griffin has a paved ramp located on the river left side of the Rogue. There is a large gravel bar leading up to the ramp. There are also tent and RV camping spots as well as toilets, picnic area and water. A ferry crossing once existed here in the past. Now all that's left is a simple concrete ramp on the north side of the river. This access concrete ramp contains no camping but has plenty of parking and a ramp. Day use only. This is a very large RV and camping park on the south side of the Rogue. It has a single lane concrete ramp. A small concrete ramp on river left. Mainly used by drift boat fishermen or smaller watercraft. Where Vannoy Creek drains into the Rogue on the north is a small debris fan island and some I+ or II- water here. The river widens some here creating some shallows on river right at certain water levels. Best route is on river left where the water is deepest. This is the first rapid of any significane on this stretch. Even though it is a simple rapid, boaters have still managed to wrap their boats and hit the large rock in the center of the bottom of the rapid. High water can create currents and whirlpools here. A straight forward run as the river makes a slight jog to the left. This rapid was named after a miner in the early 1900's that drowned here when his boat capsized on the way down to his mine. A minor rapid that kayakers may be able to find a wave to two to play in. A small island splits the river into 2 channels. Both channels contain class I+ to II- water. The left channel is more friendly at low flows. Just below an island the Rogue makes a right turn. This rapid has mainly waves but there is a hole towards the bottom that kayaks and canoes will want to avoid. A small sandbar camp on river left. At medium to lower flows there is a sandbar on river left. Higher flows this camp washes out. Another sandbar on river right. This camp usually works at most all water levels except for really high levels. River right, medium sized camp. River right near the mouth of stratton creek.